An intriguing lightweight matchup between fast-rising prospect Evan Dunham (11-0 MMA, 4-0 UFC) and former champion Sean Sherk (33-4-1 MMA, 7-4 UFC) is now official for the main card of UFC 119. MMAjunkie.com (www.mmajunkie.com) first reported the matchup earlier this month, and UFC officials today announced the main-card contest. Featuring a heavyweight rematch between Frank Mir and Antonio Rodrigo Nogueira, UFC 119 takes place Sept. 25 at Conseco Fieldhouse in Indianapolis and airs live on pay-per-view and Spike TV. The addition of the Dunham-Sherk matchup completes the evening’s five-fight main card, which airs live on pay-per-view. Two additional bouts are promised for the evening’s Spike TV-broadcast portion of the event. Sherk, 36, has not been seen in the cage since UFC 98, when he dropped a unanimous decision loss to now-champion Frankie Edgar. He was originally scheduled to fight Rafaello Oliveira at UFC 108 but fell prey to the event’s injury curse after agreeing to fight Jim Miller on the night’s main card. Two months later, Sherk was scratched from a bout with Clay Guida at UFC on Versus 1 due to another undisclosed injury. Since then, the former champion has been whisper-quiet on his career plans. A disciple of Minnesota Mixed Martial Arts, Sherk dropped to lightweight when the UFC re-introduced the 155-pound belt at UFC 64. In a bloody fight, he defeated Kenny Florian to become the promotion’s second champion in the weight class. Sherk defended the belt against Hermes Franca at UFC 73, but his title was taken away five months later when the California State Athletic Commission flagged him for performance enhancers. He steadfastly denied the use of any illegal substances. 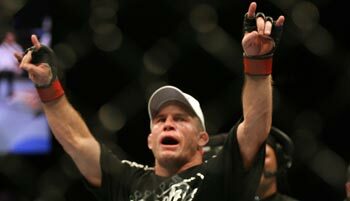 Sherk returned to action almost a year later and failed to regain his title at UFC 84 when B.J. Penn ‚ who had scooped up the undisputed belt against Joe Stevenson at UFC 80, beat him by TKO. The 28-year-old Dunham, meanwhile, put his jiu-jitsu black belt to impressive use with a decision victory over division standout Tyson Griffin at UFC 115. The Oregon native surprised many fans by controlling Griffin, a well-known escape artist, on the canvas and keeping back control throughout much of the fight. For more on UFC 119, stay tuned to the UFC Rumors section of MMAjunkie.com.